While purchasing a weather station seems like a simple idea, it’s important to end up with correct station for your specific application. Depending on requirements – turf management, crop control, disease prevention, you may require carrying sensors & components to ensure you are getting the maximum benefit from your station. Looking to monitor soil moisture? Then a turn-key ET station may be the best, allowing you to monitor soil moisture quickly and easily. Wanting high-grade of accuracy? Then custom design a system to suit your chosen sensors. The flexibility of Campbell Scientific data loggers coupled with Campbell Scientific’s range wide range of sensors, peripherals and services allows users to completely customise a weather station to suit their individual requirements. At the centre of the weather station is a programmable data logger that will measure the sensors and store data. This data can be stored in your choice of units (e.g. wind speed in m/sec, mph etc), as specific outputs required (ie Max, min, averages etc) and at intervals you require (ie Hourly, daily etc). Choosing a data logger starts with deciding on the number and type of sensors to be measured, how much data you need to store and how fast the measurements need to be taken. Our flexible data loggers have numerous channel types and programmable inputs, enabling them to measure most commercially available sensors. UV - stabilised, fibreglass reinforced enclosures house the data logger, power supply and data retrieval peripherals - providing protection from dust, humidity, precipitation, sunlight and environmental pollution. For easy viewing in the field data displays can be mounted into the enclosure. 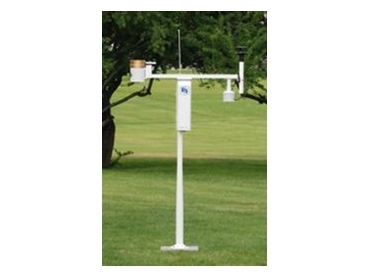 Tripods & towers are available to mount your weather station, once again depending on your needs. Tripods are sturdy, mobile and easy to deploy – particularly for uneven or rocky terrains but have a lower measurement level. Towers are best suited to permanent applications as they are cemented into the ground and allow elevated measurement heights. A wide range of high quality sensors are designed to interface directly into the custom station. The choice of sensors depends on location, accuracy requirements and of course budget constraints. The most commonly used sensors are – wind speed & direction, air/soil temp, soil moisture, relative humidity, solar radiation, precipitation & barometric pressure. However users can add as many sensor combinations as required. The data from these sensors can then be used in this format or inputted into various water and crop management models, giving you more control over your irrigation & crop management. Retrieving your data can be accomplished by many methods depending on how often data retrieval is required and the location of your station. Building a custom station allows you to select the way you want to communicate with it, either through mobile technology, radio communication, direct connection or a combination of these. Campbell Scientific offer a simply easy guide to customising weather stations. Installation can be made even simpler by having your station programmed, pre-wired and ready to go before delivery.